STUNT is a new, competitive team sport that has derived from traditional cheerleading. STUNT removes the crowd and focuses on the technical and athletic components of cheer, which include elite/group stunts, pyramids, basket tosses, jumps and tumbling skills. Each contest consists of four quarters of play (Stunts, Pyramids & Tosses, Group Jumps & Tumbling, and Team Performance) with a halftime in between the second and third quarters. STUNT was developed by USA Cheer with collaboration from groups of Title IX experts, as well as known coaches and experts in the All-Star and traditional cheerleading community. USA Cheer is the national governing body for cheer as a sport in the United States. Click the link for a more detailed video about STUNT. This innovative approach allows us to better train and prepare kids for both high school and college cheerleading. Both MGA and TUC owners are leading the way to address the needs of parents for affordable cheerleading training without the longtime commitment. By creating this partnership, we have been able to lower the cost to participate, reduce the time commitment so kids can continue to enjoy their time off, and prepare kids to cheer in college. 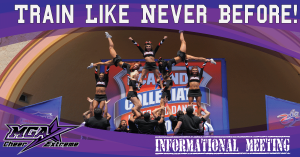 How is STUNT different to traditional competitive cheerleading? STUNT focuses on cheerleading technique, progressions, and on the athletes’ strengths. Because the competition is broken into 4 quarters, this allows coaches to place kids based on where they will best excel. Our STUNT team will practices one day a week for only two hours. There may be times where we bring in individual stunt groups or tumbling teams to work a little extra if needed. Because stunt teams do not wear traditional uniforms and competitions are head to head, the cost to participate is considerably cheaper than traditional competitive cheer and all-star cheer teams. The average cost per month will be under $90. Because events are head to head, our teams will travel to different cheer gyms in the state of Georgia. There will be no overnight stays, and currently, competitions will be held in Macon and Savannah. We are currently working on the schedule and getting other gyms to participate. The season will start in December and will conclude in April. Practices will be held on Sunday evenings so kids can participate in other school activities. If you are interested, please take just a minute to fill out the form below. We will reach out to you to provide more information. This form is to collect information about stunt.